There is a lot of confusion when it comes to natural interventions for relief of menopausal symptoms. This is partially due to the fact that not every intervention is useful for every woman. What helps one woman might not be effective for her sister. The intervention needs to be matched to the unique symptom picture of the woman. A good example of this is black cohosh. This herb is found in nearly every blend for menopausal symptoms, but this herb isn’t the one that will help everyone. It is most likely to help women that have a particular constellation of symptoms, such as hot flashes, depression, and achy muscles or joints. Studies are showing that black cohosh may reduce the hormone surges associated with hot flashes. Black cohosh might also have constituents that act similarly to the medications known as selective serotonin reuptake inhibitors (SSRIs), which could explain its possible mood benefits. In addition to this, studies on SSRIs for menopausal symptoms showed a reduction in the number of hot flashes. Black cohosh also has pain-relieving attributes that make it an herb to choose for complaints not related to menopause. It has analgesic and inflammation modulating constituents that make it a consideration for joint and muscle pain. It can relax muscles and help with muscle spasms. It can be used for women with menstrual cramps because it relaxes smooth muscles such as in the uterus. Again, the herb is more matched to women who have the combination of cramps, mood issues, and body pain. It may also help with headaches that are related to hormonal issues. 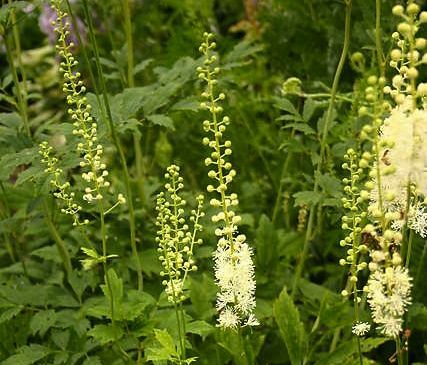 Black cohosh is also an herbal option for men who have low back and knee pain, especially if they also have prostate issues or a lot of stress. Side effects are occasionally reported with black cohosh. The most common one is a headache that can be alleviated by adding ginger. This entry was posted in Health and tagged hotflashes, joint pain, menopause, perimenopause, women's health. Bookmark the permalink.